This tour gives you the perfect balance of time in the helicopter and on the ground at the Grand Canyon. Your tour starts with a limo ride to the airport located right off the Las Vegas Strip. You fly over the Las Vegas skyline to Hoover Dam and Lake Mead before entering the Grand Canyon for a spectacular flight above and below the rim. 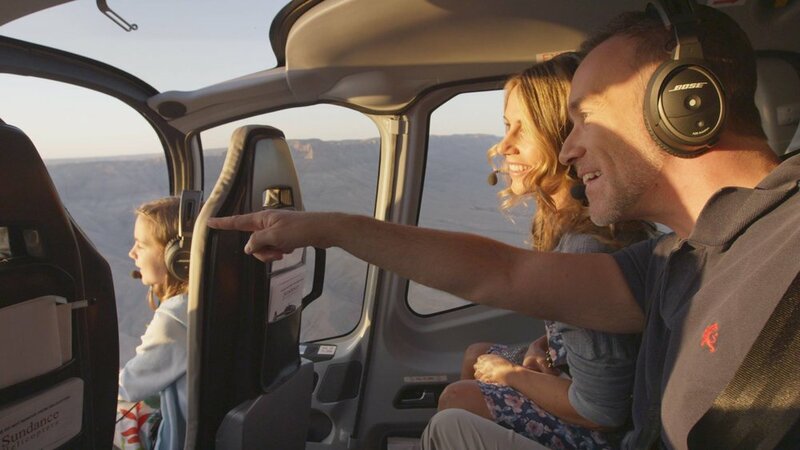 You land inside the Grand Canyon at Sundance’s exclusive landing area near the Colorado River for 30 minutes to take photos and enjoy a champagne picnic prepared by your pilot. You fly out of the Grand Canyon back to Las Vegas with a flight over the Las Vegas Strip and Downtown. Your limo driver will be waiting to take you back to your hotel. Over 50% of your time is spent on tour activities and not waiting/commuting! Over 50% of your tour is spent in the helicopter or at the Grand Canyon, all other companies are less! Fly Sundance and spend over 50% of your tour in the helicopter or at the Grand Canyon! With Sundance you get the longest helicopter flight which goes from the Las Vegas Strip over Hoover Dam and Lake Mead before flying into the Grand Canyon. With Sundance you get at least 90 minutes in the helicopter, this is what you are paying for so don't settle for less! Sundance has a very nice VIP helicopter terminal in Las Vegas. With Sundance you are checked in quickly with minimal time waiting for your tour to start. Your helicopter is waiting right outside the terminal. During your 35 minute landing the pilot will prepare a picnic with snacks, beverages, and champagne. Sundance can also make your special occasion extra special by offering custom made cakes with a message on top! Save money with our discounts plus we will request the front seats for you!